Sales of Afghanistan’s ancient carpet-weaving industry have dropped by half in the past year as war with Taliban militants heats up and neighboring Pakistan clamps down on border traffic. Prized by buyers as much for their artistry as utility, carpets are still a chief export of the impoverished nation, but their share has shrunk to six percent from 27 percent within less than a decade. War, poverty and the transport constraints of a landlocked country have shredded sales for an industry that experts say dates back at least 2,500 years. Legend holds that Alexander the Great sent a carpet from the area to his mother. At a factory in Kabul, the capital, women weave on looms while men in dust-masks sort heaps of wool. “We have invited a lot (of buyers),” said Diljam Manan Qassimy, a manager at the factory, Afghanistan Rugs and Carpet Center. Violence has surged in Kabul, with attacks in the last year ranging from a truck bomb that killed at least 80 people and an ambulance bomb that killed 100, to a hotel raid that killed 20. Carpets ranked fourth among Afghanistan’s legal exports at $38 million in the 2016-17 fiscal year, its Central Statistics Organization says. More than 85 percent went to Pakistan. The export figure dropped by more than half from $89.5 million a year earlier. That in turn was a plunge from more peaceful times eight years earlier, when exports stood at $150 million. Sales prospects are no brighter at home, as few Afghans can afford carpets that cost between $70 and $250 per square meter, outstripping the average monthly income. Reliance on Pakistan and its seaports leaves Afghan sellers vulnerable to frequent border control changes over the neighbors’ mutual accusations of failing to rein in cross-border militant attacks. Last year, a major border crossing at Torkham closed for 40 days, Qassimy said. Traders from Pakistan can earn a premium ranging from 10 percent to 15 percent by buying Afghan carpets and re-exporting them, said Pervez Hussain, who owns a Pakistani retailer, Afghan Carpets. “People don’t go to Afghanistan, and their washing methods are not that good, so the carpets come to Pakistan and are washed here and are exported from here,” he said. Both countries’ industries benefit by working together, he added. “There are a lot of big Afghan traders who are in Pakistan and they export directly from here,” he said. Qassimy’s Kabul factory has found ways to sell carpets to Australian, British and German buyers by opening showrooms in those countries. But his costs for air transport are triple those of a typical Pakistani vendor, who can use his country’s seaports instead. The disparity keeps margins tight, forcing him to charge higher prices and pay workers lower wages, Qassimy said. The industry spans many Arabic and Asian nations. But most Afghan carpets, best-known for their dark red color, are hand-woven in dense knot patterns, and last longer than machine-made rugs using synthetic materials. Ali Reza, 35, weaves at home, sharing 8,000 Afghani ($116) with three artisans for a carpet that takes a month to complete. “It’s really difficult to meet the needs of your family with such amount,” he said. In Kabul’s famed Chicken Street market, carpet merchant Ehsan, who goes by one name, has seen a steady decline in foreign shoppers. On sale in his Istalif Gallery are carpets hand-woven from sheep or camel wool, printed with elephant feet symbols or flowers. Some are 50 years old. 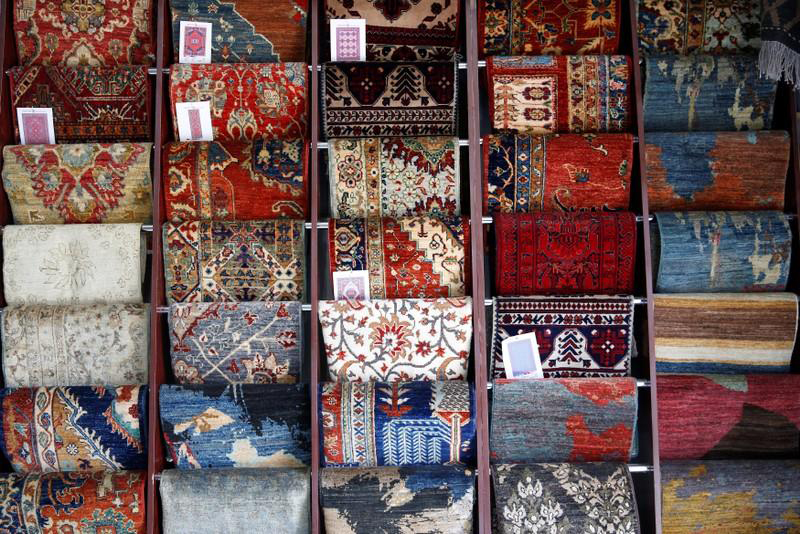 In Afghanistan’s latest effort to revive its carpet industry, the commerce ministry is preparing a plan to cut air transport costs to India and Dubai, offer financial help and boost marketing, ministry official Ahmad Zia SaydKhaili said. An initiative announced in January will speed export customs procedures at Kabul airport. Since buyers cannot risk coming to Afghanistan, boosting exports will be critical, Qassimy said.